Na, na, na, na, na, na, na, na, na, na, na, na, na, na, na, na, Batman! Since his first appearance in a 1939 edition of “Detective” comics, Batman has been a part of our culture, whether portrayed as the do-gooding Boy Scout of the campy 1960s TV series or the dark, brooding vigilante from Frank Miller’s “The Dark Knight Returns” comic books. Unlike many other comic book superheroes, Batman has no special powers. He can’t outrun a speeding bullet, turn green when enraged or communicate with aquatic life. However, in addition to his physical and mental skills, he does have some fantastic toys, all financed by the personal fortune of Bruce Wayne, his alter ego. While the BatComputer, Batrope and Shark Repellent Bat-Spray all saved the day at one time or another, the Batmobile has to be Batman’s coolest crime-fighting accessory. And like Batman, the Batmobile’s portrayal has changed through the years. While most of us remember the Batmobile of the 1960s—a wild, turbine-powered car that was really a 1955 Lincoln Futura concept modified by George Barris—Batman’s cars have ranged from the somewhat chunky sedans featured in the early comics to the sleek, winged creations of the recent movies and animated TV shows. Although it may not resemble any small mammals, Dan Senecal, a quality control inspector from Saratoga Springs, N.Y., has created his own version of the Batmobile. And it’s based on a 1966 VW Kombi bus. 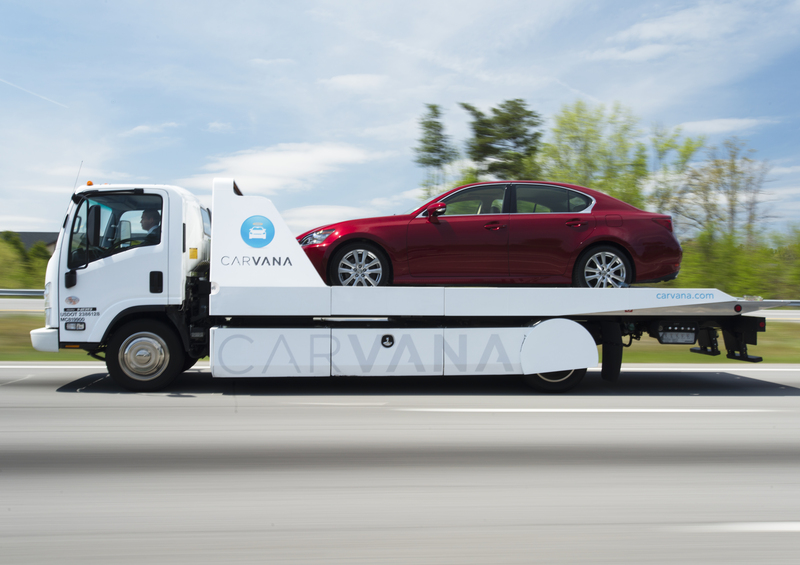 While the Batvan doesn’t meet the letter of the Challenge rules regarding missing major body panels, none of the participants voiced protests. Instead, they voted it Challengers’ Choice. 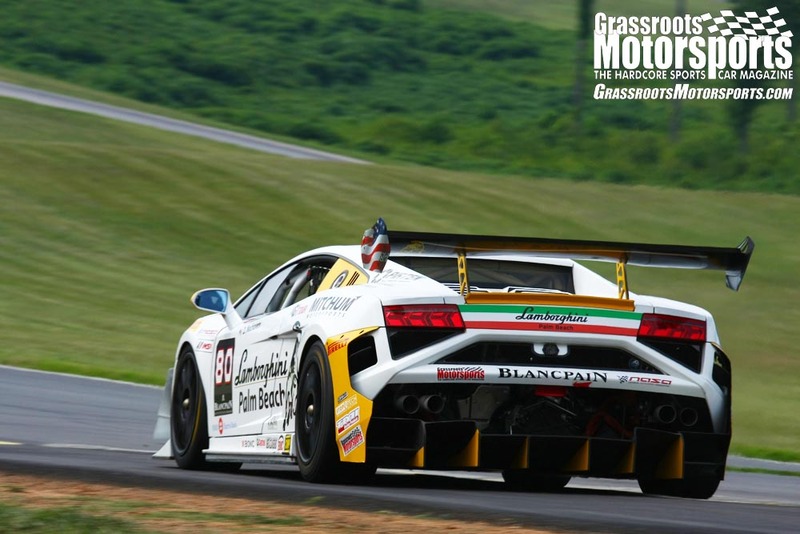 Our recent Kumho Tires Grassroots Motorsports $2004 Challenge Presented by CRC Industries attracted a wide range of cars, with 77 teams making the big show. Faced with a budget of no more than $2004, each team made their best attempt at buying, building and preparing a car that would excel in our three-event competition: autocrossing, drag racing and concours judging. While some cars certainly arrived as prerace favorites, one in particular attracted the most attention the night before the show. You gotta see the bus in the hotel parking lot, people kept saying. Bus? What bus? While many Challenge competitors armed themselves with turbochargers, nitrous bottles and cheater slicks, Dan and his son, Ian, had a crime-fighting computer, rocket launchers, huge fins and acres of flat-black paint. The centers of their Keystone mag wheels—a donation from Dan’s brother after he couldn’t get $20 for them at his yard sale—even carried red Batman logos, just like the famed George Barris creation. Dan’s V8 thunder came courtesy of a local oval track racer who had built a healthy 0.060"-over 350. The racer’s 20-year-old son then placed said engine into a Chevy Monte Carlo. Dan notes that he was in the right place at the right time, as a NAPA delivery to the father’s shop landed him right in the middle of a heated debate between the dad and the son. Dan got the Monte Carlo for $200—if he promised to take the car right then and get it out of the county. Problem solved. Dan knew where he could find a lightweight body. “It was in the local Want Ad Digest for $500,” he says of the VW bus. “No engine, rusty, and sitting at the end of the owner’s driveway, it was hit by the snowplow a few times.” Dan was the only one to call on the bus, and when he showed up with $150 and a tow bar, the van was his. Air-cooled VWs may be prized by collectors, but this one was no creampuff. The front sheet metal was a mess and a headlight bucket had been kicked in. Even the trademark VW nose logo was missing. It was the perfect starting point for a Challenge project. Once the bus was home, Dan and Ian didn’t waste much time, as they removed the body from the rest of the vehicle that very day. The Monte Carlo body was yanked from its frame in a similar manner—well, the Sawzall wasn’t required—and the chassis was prepped for the melding. The Monte Carlo was longer than the bus, so Dan removed the front frame horns. The vehicles had different wheelbases, too, but Dan didn’t see that as a problem, either. Since the Monte Carlo’s body was now a thing of the past, Dan figured its chassis would need some strengthening. The Monte Carlo frame is built from U-shaped rails, and Dan made plates and welded them to the open sides. “With no body to aid rigidity, I thought this would be necessary,” he explains. With the engine in back and out of the way, Dan needed to make room for the pilot, placing him all the way up front, not unlike the driver of a city bus. 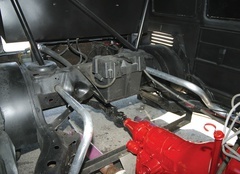 To give the driver a solid footing, Dan installed a front floor that is level with the underside of the frame rails. The prepared Monte Carlo frame was wheeled below the waiting VW body and placed on jack stands. Time to join the two halves together. “Once I got the look and location I wanted, I welded 1/4-inch plates bent 90 degrees between the frame and inside body struts,” Dan explains, as he figured the lower the body, the lower the center of gravity. Openings for the wheels would be cut as needed. 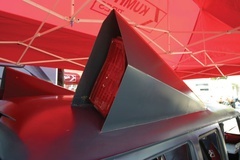 The Batvan carries fins, a popular design cue among Batmobiles. Those fins house the Monte Carlo taillights. As the lore of Batman goes, Bruce Wayne’s original plan didn’t involve dressing up like a large flying rodent. He simply wanted to fight crime, so he spent years honing his craft. His first outing as a vigilante didn’t go according to plan, and that night young Bruce sat alone, wondering why criminals didn’t fear him. Suddenly a large bat crashed through a window: Something clicked inside Bruce Wayne, and the Batman was born. Dan followed a similar path. Initially, he was just repeating the old formula of placing a big engine inside a lightweight car. Just before painting his creation, however, Dan had his own epiphany. “Looking at the roof of the bus was like looking down a football field,” he explains. “I wanted something to break up all the openness. I still had to find a place for taillights; the original bus lights were smashed. The Bat-team tried to throw in the towel, but other Challenge competitors came to their rescue. 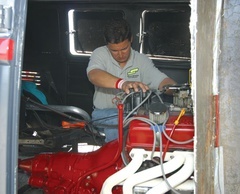 Rene Marin of CRC Motorsports spent hours working on the Batvan’s propulsion system. As happens too often, the trip to the Challenge was an event in its own right. Dan and family had a long journey in store from their New York home to Central Florida’s Gainesville Raceway, home of the $2004 Challenge, and somewhere around Jacksonville, Fla., the clutch in Dan’s half-ton Chevy pickup failed. And also like so many other participants, Dan didn’t get to do a lot of pre-event testing. In fact, he was still tuning the beast once in Gainesville, breaking out the timing light and trying to dial in enough ignition advance. It just never ran right, he reports, and the engine liked to backfire through the carburetor. Rene almost lost some skin for the cause, as he was inside the engine compartment when a radiator hose blew. There was a strange, long silence as everyone in the immediate area waited for his okay. A collective sigh of relief was released when Rene said he was fine. 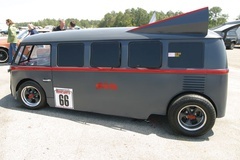 Even though the Batvan never made either of the event’s speed contests, Dan and crew—and spectators and anyone else with a free hand—pushed the creation to the judges’ tent; at least it would get a concours score. 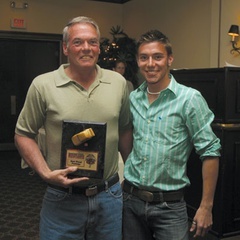 Dan’s efforts didn’t pan out with any time slips, but he still collected some hardware during Saturday’s banquet. The blown radiator hose incident earned the team an honorable mention in the Most Spectacular Failure competition, while the Batman package was rewarded with a trophy for the best visual theme. However, the best award may have come from the competition. 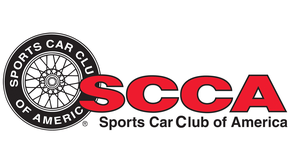 Even though the Batvan finished 75th out of 77 cars, the Senecal family received the Challengers’ Choice prize, an award that’s bestowed by the entire field. The efforts of Dan and Ian Senecal weren’t for nothing. 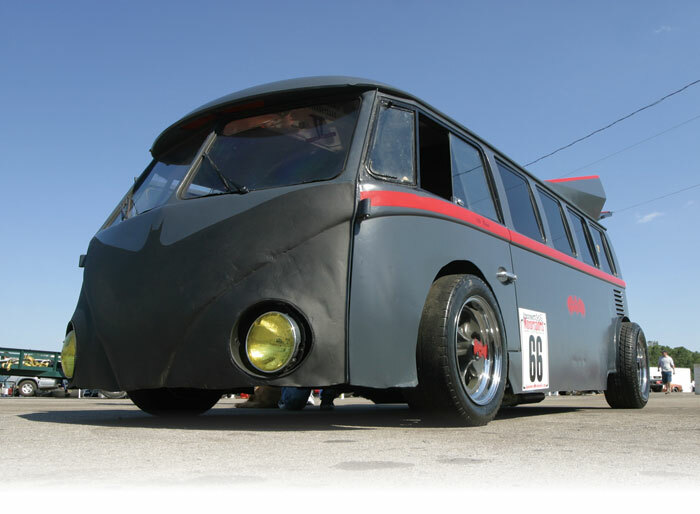 Even though the Batvan didn’t set any speed records, the team received three awards. Upon returning home to New York, Dan got to play detective himself and figure out what went wrong. A compression check yielded some clues, as five of the eight cylinders recorded 0 psi. Disassembling the engine revealed more horrors, including burned pistons. Dan believes the valve guides seized on the valve stems, causing the valves to open only intermittently. As a result, a large air pocket formed inside the intake manifold, causing the cylinder heads to reach about 700 degrees. The result was a meltdown of gothic proportions. No one is certain if the Batvan will make another appearance over Gainesville, but its fans are hoping for a repeat showing next year—same bat-time, same bat-channel.